Hyperlocal Newspapers. Concept, plan and pilot. With the decline of newsprint, we need new paradigms. I am not yet convinced that everyone will be able to afford reading news on portable screens in the near future, and I'm also concerned about other negative side-effects of this assumption. Aside from the economics, other problems with the digital model involve the related issues of the editorial-community loop, competition for eyeballs, and advertising. I've thought hard about this problem and found one relatively ecological and economical solution using print. 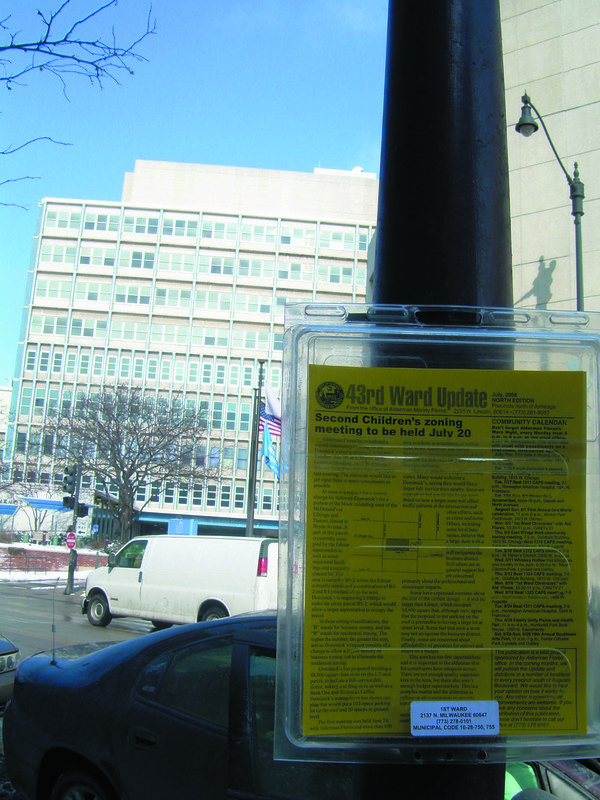 I discovered that, in terms of Chicago's Municipal Code, inexpensive plastic bins attached to light poles are legally considered newsracks and are protected by the city's newsrack ordinance. In a pilot, I developed a monthly (or even weekly) one-page publication concept that would be unique to each community. Every neighbor can read this without any batteries; and they can submit news to it, and go to the web for more information. There are also important advertising possibilities in this model. In 2004, I piloted the concept in Ukrainian Village with great success.